Posted: Thursday, June 18, 2015. 4:08 pm CST. Thursday, June 18th, 2015. BMG: National team footballers Woodrow West and Deon McCauley will suit up for the Honduran side CD Progreso de Honduras, based in the central city of El Progreso. The team was promoted from the Honduran second division last year, made the top league playoffs in the opening half-season and finished sixth overall. Star goalkeeper West, who is a four-time Premier League of Belize (PLB) champion with the Belmopan Bandits FC, has been confirmed to have met with officials of El Progreso to sign a contract, while McCauley who played last year for U.S. second division side Atlanta Silverbacks, now moves to Honduras. In announcing the departure of West from the Bandits, team owner and football manager John Saldivar, said he had “mixed emotions.” He admitted that he was sad, because, quote, “Woodrow was the first player I signed when I decided to reenter football in 2011. A good team starts with a good goalkeeper. Woodrow helped the club to four championships and was a leader on the club. It is sad to lose auch a champion. But, I am happy that Woodrow will finally get a second chance to play outside of Belize, something he has wanted and deserved for many years. Good luck Woodrow, a space will always be here for you at the Bandits.” End quote. Last year McCauley’s move to a Greek side was nixed by the Bandits, who later dragged their feet in signing Deon’s release to join Atlanta until they felt some national pressure. McCauley scored three goals in sixteen official appearances for the Silverbacks. 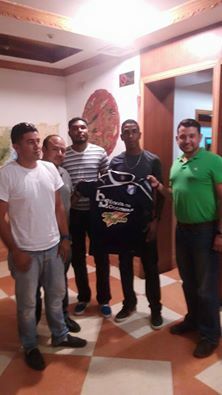 The two join fellow national footballer Elroy Smith, who plays for Honduran side Platense. Photo courtesy of Emanuel Pech.